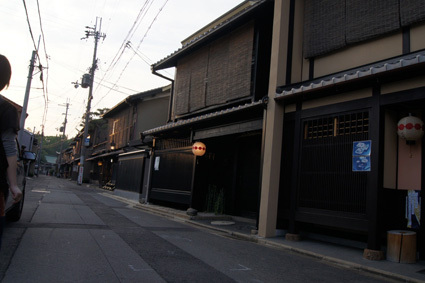 Kyoto has five hanamachi, whici are entertainment districts. 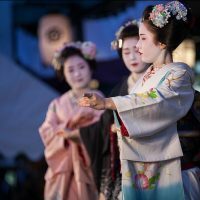 Kamishitiken, Gionkobu, Gionhigashi, Pontocho, and Miyagawacho. “Gokagai”, which means “five flower towns”, is the collective name of five districts. 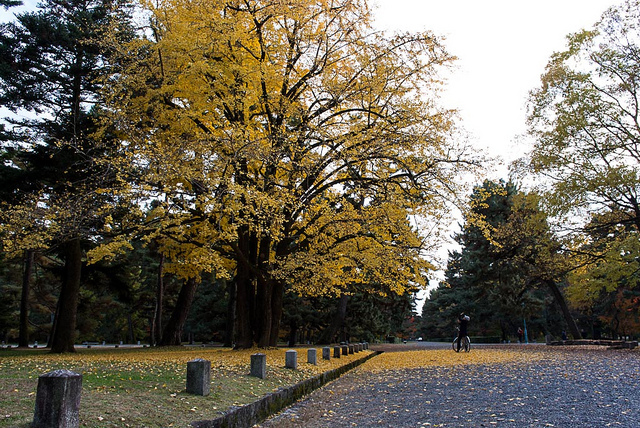 Among them Pontocho has the longest history and prestigious background. What kind of world is waiting after we pass through the door of this teahouse? Okami, the proprietress of teahouse, appears. She is called Mother Yoshie. Of course, she was a maiko han when she was younger. She is a super-veteran with the career of some decades. 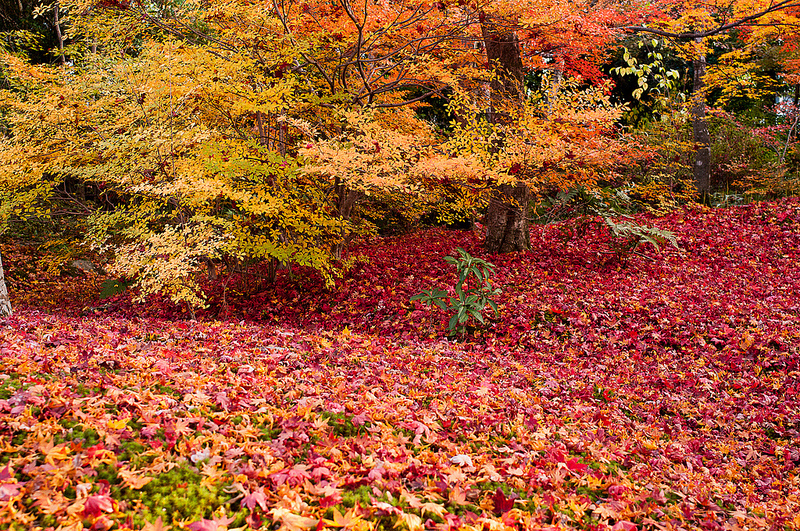 She is an important person who knows the past and today’s flower towns of Kyoto. 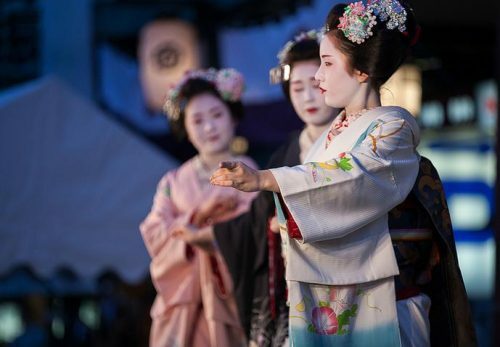 Girls receive tough training to be maiko. When they are still in junior high school or they enter a high school, their apprenticeship starts. 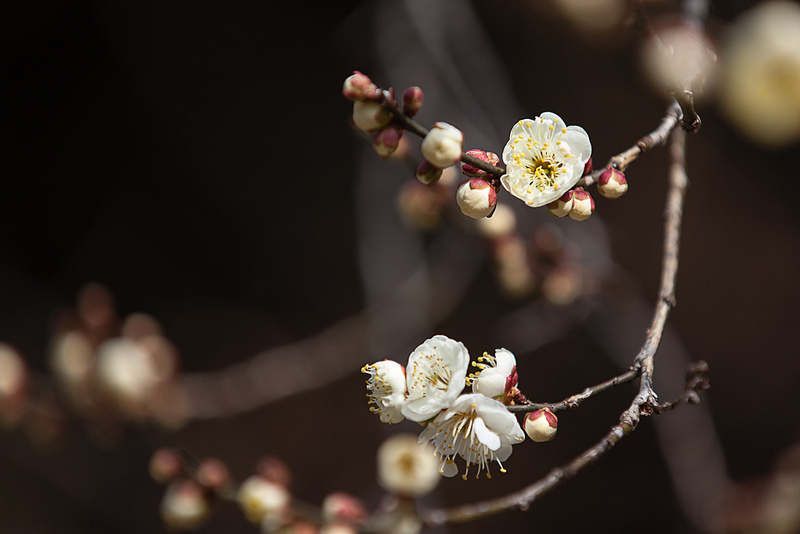 The first step is called “shikomi” or “preparation” and it lasts about half a year or one year. 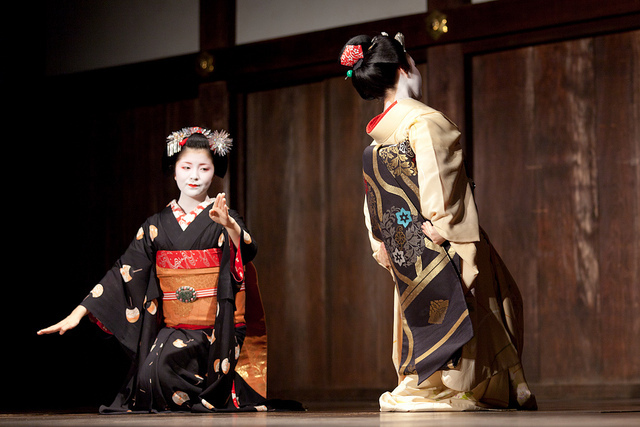 When they are recognized as maiko, they debut and appear on stage. First, they showed us a dance. 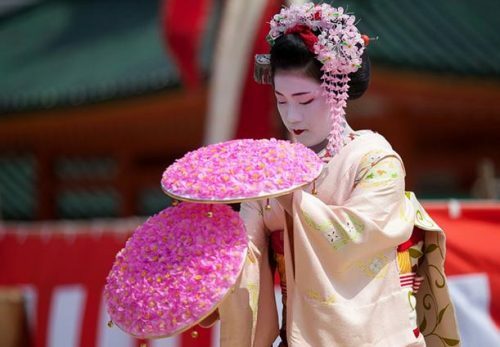 “Maiko” means “dancing woman” so their basic work is “dancing”. Incidentally, my grandmother was a teacher of a Japanese dance school so I had many opportunities to see this kind of dance since I was a small child. But the dance looks different in Kyoto. I believe that’s because of the prestige supported by history. I took photos of dishes on the table. But please keep in mind that I forgot to take some. 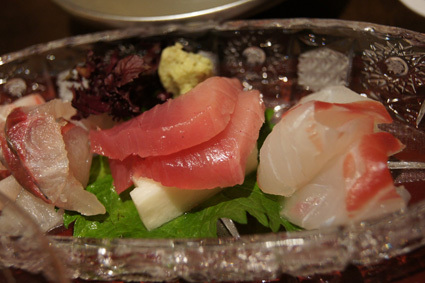 This is the second dish, otsukuri or sashimi dish. It has elegant flavor when you eat it with a little of tamari soy source. 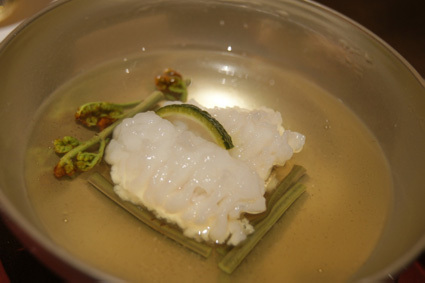 Wild plants and kabosu, or green citrus, show careful work of traditional restaurant of Kyoto. The flavor is very elegant, too. After the soup, I forgot taking some photos. 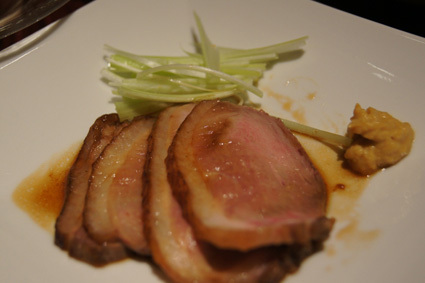 This is the main dish, duck. It tasted like kakuni, or Japanese simmered pork. I ate it with a little of mustard. Rich flavor of duck spread in my mouth. Delicious. Perhaps I didn’t take photos again. 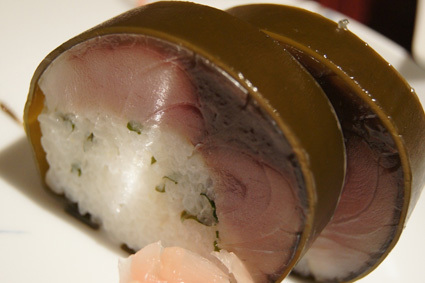 After some dishes, sushi rolls of mackerel came. They are wrapped in seaweed. Good. The quality of mackerel was very good. I enjoyed unique smell and taste of mackerel. It was vinegared delicately. 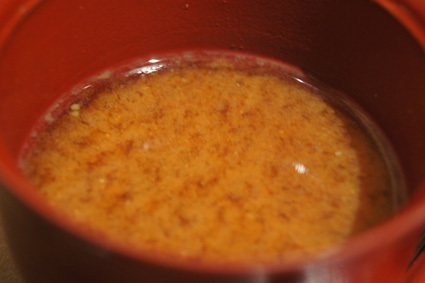 A bowl of miso soup. It had a complex flavor so I guessed that the broth had been made from special ingredients that are not used at homes. For your information, teahouses are basically the place to play. Dishes are not cooked at a teahouse but they are delivered from a partner restaurant in the neighborhood. I am a very curious person so I often went out of the teahouse and watched the street. I happened to see the dishes were brought. The whole town operates a business. I heard that anyone in the neighbor knew how the business of the flower town went on. It is such a closed and conservative world. Therefore, I guess, people of flower town can keep strong tie and work together in good combination. I don’t hate this kind of world or value. Perhaps many people imagine “ozashiki”, a room covered with tatami mats when they hear teahouse. 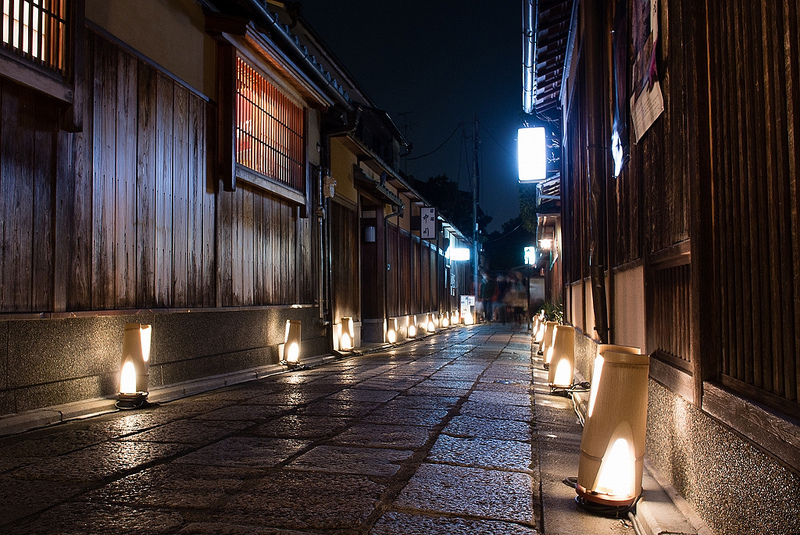 But today’s teahouses are modernized as night social clubs. This teahouse has a karaoke room and a bar. 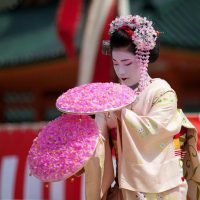 On this day, a total of five maiko entertained us. 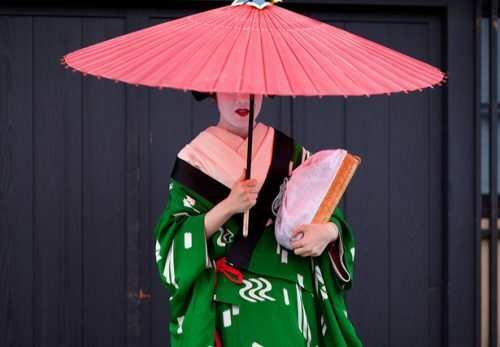 There are only 100 maiko han in Kyoto today. 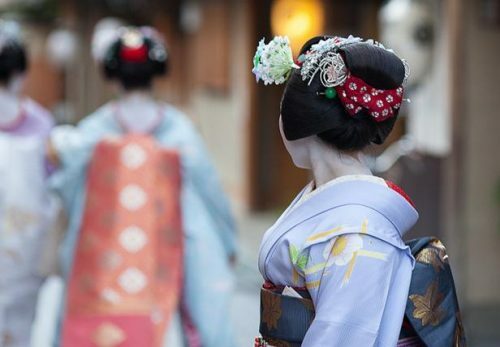 I heard that all teahouses scrambled for maiko every day and night. Later, I thought we had received special treatment. We had a monopoly on five maiko han a night. Mr. Daisuke Wasa’s brother, Kaoru. He came along with us. 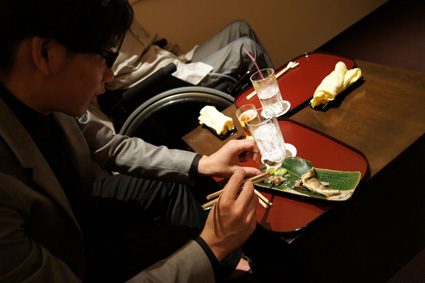 He was born in Kochi so we thought he must be good at “fish boning”. We asked him to bone sweet fish but the head was torn off. Poor sweet fish. It was a good example of “The best workman will blunder sometimes”. While everyone has a meal, the okami and young okami invited me to a zashiki room upstairs. The ozashiki room has the traditional and typical appearance. Yes, it is the world of “Maiko han” which we often see in movies and comics. Maiko are going to dance on the stage. After that, my curiosity made me see the backstage that is never seen normally. What was that? …to be continued!